Atoussa Cameron, NP-BC, is a board-certified licensed health care provider who has practiced dermatology in partnership with Dr. Jeffrey Klein and Dr. Kathleen Hutton at HK Dermatology in the community of San Juan Capistrano, California. Atoussa joined the practice in 1998 and since then has become a valuable member of the team. 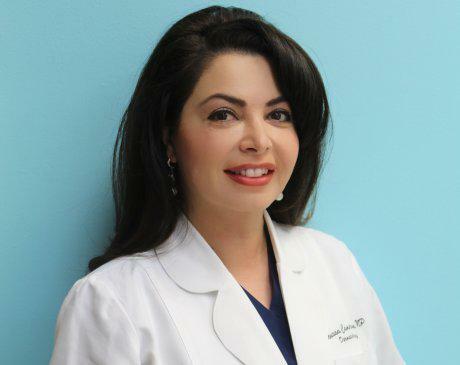 Her education, combined with years of experience, allows her to provide excellent patient care in both areas of clinical and cosmetic dermatology. Atoussa has a knack for connecting with patients on a personal level and practices a variety of clinical and cosmetic dermatologic procedures, including skin cancer screening, biopsies, excisions, acne, wart treatments, lasers therapy, thermage, Botox®, and fillers such as Juvederm® and Restylane®. In addition to treating dermatology patients, Atoussa often assists Drs. Klein and Kassardjian in the operating room during liposuction procedures. She holds dual certifications from the American Nurses Credentialing Center and the American Association of Nurse Practitioners. Atoussa is heavily involved in the day-to-day operations of HK Dermatology, which include coordinating the Klein Tumescent Liposuction Course, a three-day program that teaches participants about and provides experience for tumescent anesthesia. During the course, Atoussa teaches course participants about Tumescent Anesthesia and provides them with hands-on experience to learn the technique. When meeting Atoussa, it is apparent that she truly enjoys her job, cares deeply about the quality of work she delivers, and treats all her patients with the respect and high standards of care that they deserve. Atoussa is passionate about her work and cares deeply about providing the highest quality care possible for her patients. These are the main insurance companies we accept. If you are a member of a smaller insurance company, please call them to see if we are a provider.